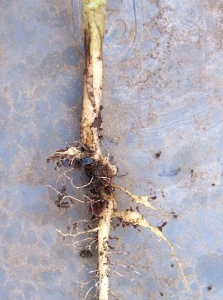 In the summer of 2016, clubroot disease was found throughout a field of canola in the Verner area of West Nipissing. 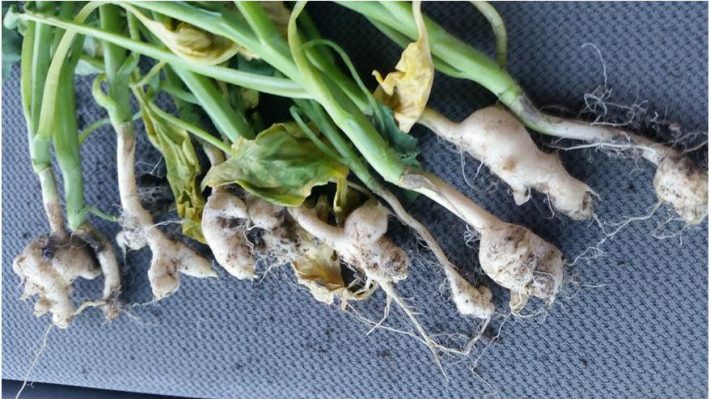 Clubroot has been established in Brassica vegetable crops in Ontario for a number of years, but this was the first time the disease was confirmed in Ontario canola. 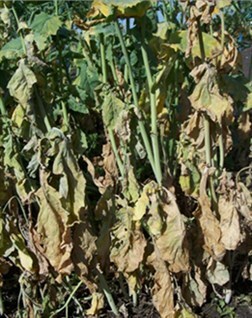 Above ground symptoms of clubroot include yellowing, stunting, wilting, premature ripening, and plant death. The above ground symptoms are similar to those of other diseases and nutrient deficiencies, lack of water, or high temperatures. Infections that occur at later plant stages may not result in above ground symptoms. 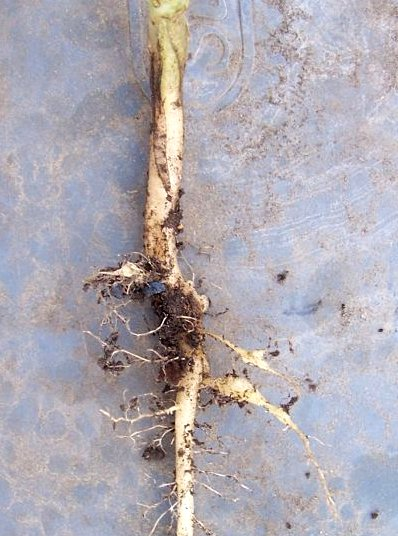 Proper diagnosis of clubroot infection must include digging up plant roots to check for gall formation. Roots of infected plants become malformed and cannot adequately transport water or nutrients. When scouting for clubroot, walk out to areas of the field that ripen prematurely and pull up plants to look for clubbed roots. There may be little to no yield loss where spore counts are low and conditions slow the plant infection (low soil moisture, pH above 7.2). There can be up to 100% yield loss across the field or in areas of a field where spore counts are high and/or conditions favour infection early in the season. 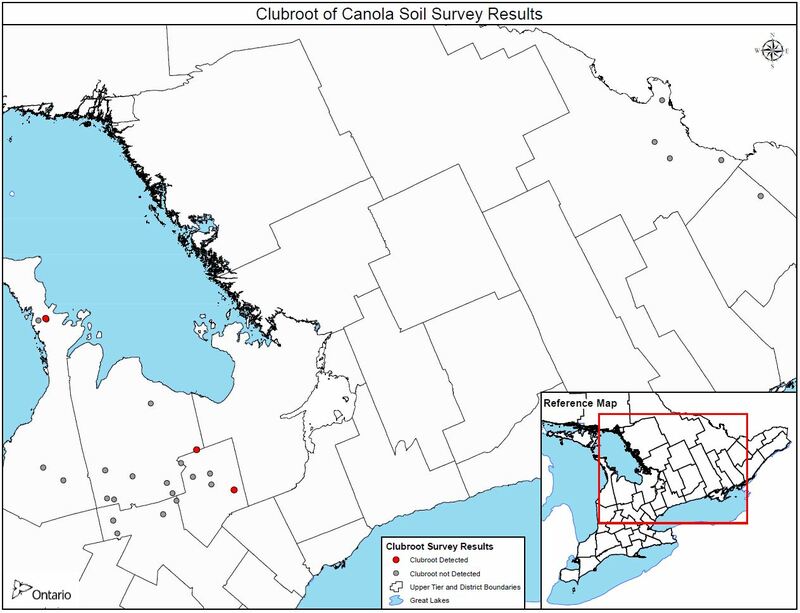 In response to the discovery of clubroot in Ontario canola, a preliminary soil survey was conducted across the province. Soil samples were taken from fields where canola has been grown in the last 3 years targeting many, but not all, canola growing regions in Ontario. Fields were sampled based on voluntary participation by farmers and agronomists, and sample sites do not represent a comprehensive assessment of all canola fields or regions of Ontario. For those samples taken by OMAFRA, approximately 20 soil cores (8” deep) were taken from each of the sampled fields. Sampling was targeted to areas of the field where infections are likely to begin, including a “W” pattern near the major entrance to the field and in some cases, in wet areas of the field. While taking the samples, sanitation procedures were carried out to ensure the samples were not contaminated and the disease was not spread during the sampling process. This includes using a bleach solution to clean soil probes, buckets, shovels and boots and/or using boot covers. 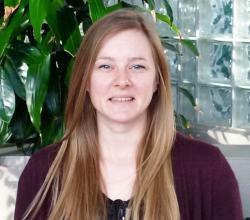 A total of 95 soil samples were collected and analysed, and clubroot was detected in 11 of the sampled fields. 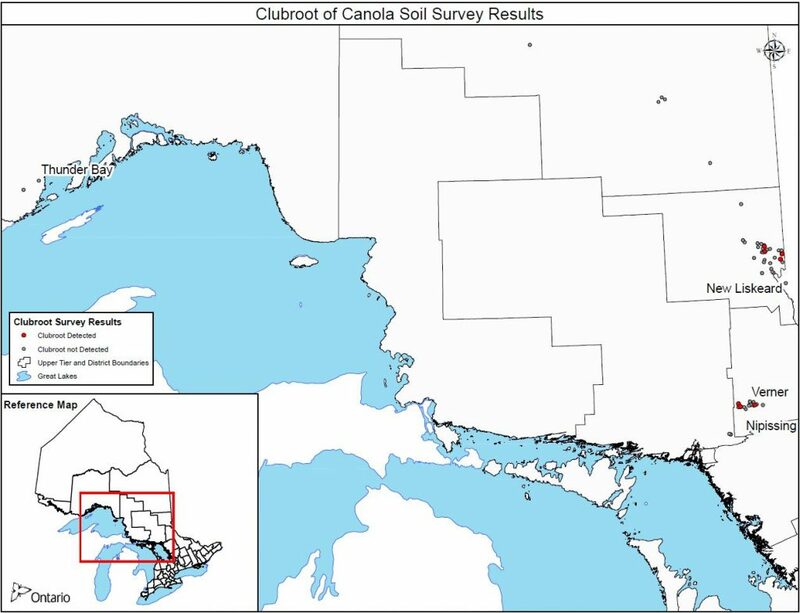 Clubroot was detected in fields in the areas of Temiskaming Shores/New Liskeard, West Nipissing, Bruce Peninsula, and Dufferin County (see the survey maps at the bottom of this article). 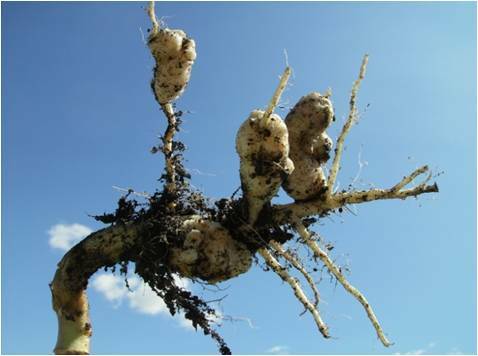 UPDATE May 12 – The first clubroot positive field in Verner was identified as having pathotype 2. Pathotyping for the other positive sites is ongoing. Clubroot moves through soil transferred from one field to another. This can occur through movement of soil on farm equipment, in manure, in water, or through erosion, to name a few. Once clubroot is established in a field it cannot be eradicated. Spores can survive in soil for up to 20 years, but reproductive spore counts are significantly reduced when there is no host crop present. Canola can be grown successfully in fields where clubroot has been detected, when good sanitation and management practices are followed. The most effective management strategy is using a long crop rotation (4 to 5 years) to prevent spore build-up. Growing clubroot resistant varieties is also a recommended management practice, but it is important to note that resistance can break down over time because multiple strains of clubroot can exist in a field. Good sanitation of field equipment and practices that restrict the movement of soil from one field to another are important in managing the spread of clubroot. For example, tilling and planting clubroot infested fields last can reduce the spread of the disease to fields that are not infected. The level of equipment sanitation depends on the level of perceived risk, and can include removing loose soil from equipment, pressure washing, and disinfection with a bleach solution. There are currently no pesticides registered for the control or suppression of clubroot in canola. 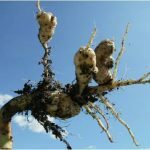 Now that clubroot has been detected in multiple areas of Ontario, canola growers across the province should monitor their crops annually for presence of this disease. Fields should be observed in summer and fall for areas of yellowing, wilting, stunting and premature ripening. Walk out to areas of the field that exhibit these symptoms and pull up the plant roots to check for galls. Soil and plant samples can be submitted to diagnostic labs to confirm the presence of the disease. Comprehensive resources on identifying and managing clubroot disease can be found at www.clubroot.ca. Speak to your seed dealer about the availability and performance of clubroot resistance canola varieties. Thank you to the Canola Council of Canada and www.clubroot.ca for information on clubroot identification and management. Organic Amendment Options – What’s the best fit?